"I was in a Minim Overbag (rated to -5°C) with an Ultra Vest and Minimus Down Trousers and Socks. I was warm enough to sleep …The temperature varied between -18°C & -21°C all night." Technical Note: A useful test which showed that our Sleep System rating for this lightweight clothing used inside a sleeping bag is on the cautious side (as intended). The rating of -15°C is for using a jacket, but in fact the vest performed fine on this test. * Peter wore lightweight thermals under his gear. The fans suddenly roar into life again and blast me out of sleep, as they have done every half hour throughout the night. Each time the temperature rises to -18°C these monsters kick in automatically and drop it to -21°C again. I'm warm enough, but I’ve given up trying to sleep through the racket. The noise is just too powerful, particularly when they surge into action, like being shut in a room with three big aero engines. Ear plugs is what I need, more useful right now than an extra kilo of down in my sleeping bag. I peer awkwardly out of my breathing hole (sticking one's head out into the cold is very unattractive) and squint at the little clock propped up on some crates alongside. 4 a.m. It must be frozen. It was 3.50 the last time I looked ages ago. I'm desperate for a pee again. The pee-bottle is full and the loo is miles away. Crisis time. I glance across at Pete (Elliott) a few yards away. Nothing visible, not even his nose, and no movement. Maybe he brought earplugs. Then suddenly the decision is made. I scramble out of the bag as quickly as I can, shoes on, no time for shoelaces, and trot off across the cold metal floor to the cold metal staircase, thankful that I'm testing the down trousers tonight. Three floors down and I scuttle through the vast warehouse, keeping a wary eye out for the stacker trucks whizzing about. This place works all night. It's only nutters like us who would come here to sleep. Then back into the haven of my bag. Shiver for a few minutes until the frigid air I brought in with me warms up, then sleep, curse the fans, sleep, curse, until at 6 a.m. we both sit up and decide it's time to escape. The fans are roaring again and the air quickly freezes my hands into blocks of wood in the few minutes it takes to pack the gear away. It really is very cold, more so than I realised tucked in my cocoon. The gear has done its job and kept us warm throughout the night, but it failed the soundproofing test. I think we'll pick somewhere quieter next time. 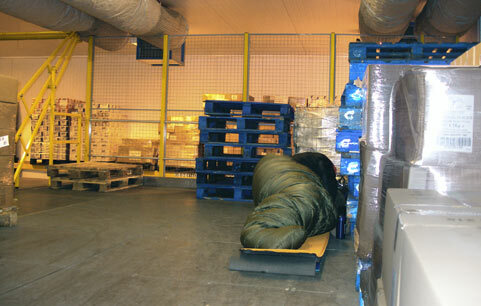 Pete Elliott and I were 'testing' our bags inside a huge cold store. We wanted to form our own opinions on some of our gear and this kind of ‘civilised’ environment (we could have walked out at any point) meant that we could try sleeping in bags at temperatures colder than their normal ratings. It was also important to spend a full night to take account of the dip in metabolism in the early hours. Pete was using a Hispar 500 (rated to -15°C). I was in a Minim Overbag (rated to –5°C) with an Ultra Vest and Minimus Down Trousers and Socks. I was warm enough to sleep and so was Pete. The temperature varied between -18°C & -21°C all night. There was considerable low level air movement when the fans were blowing, although the main blast was channelled along porous fabric tubing. The air currents (below -21°C) will have lowered the effective temperature in the room by a further few degrees, which is why it felt so cold when we got out of our bags. The owners kindly gave us permission to spend the night in an out-of-the-way corner of the store and warned us about the fans and the noise of the trucks below. They were right!